The Hawaii Home Ownership Center (HHOC) is a little known non-profit entity that has served approximately 2,000 families in its short time as a service provider in Hawaii. The Center provides counseling to individuals and families who are considering purchasing a home for the first time in Hawaii. They also provide other related services that include, but are not limited to, foreclosure counseling. HHOC is well-known among realtors and lenders, but not to the general public. Working with a limited budget and staff, the Center must be prudent and efficient with what they do. The Hawaii Home Ownership Center had done limited advertising, so our agency explored all PR opportunities, which would allow the Center to be visible in the market. This increased exposure helped to garner new clients and also aided with funding. As a member of the board, we recommended that they begin to lobby the legislature to garner grants-in-aid and related funding. The HHOC improved their visibility and successfully received funding through our agency’s efforts. Previously, the HHOC used somewhat lackluster traditional fundraising efforts including a golf tournament and a recognition luncheon. We approached the concept of a high-end new fundraiser that targeted their industry. We also partnered with other companies and organizations to help grow awareness and to raise funds. 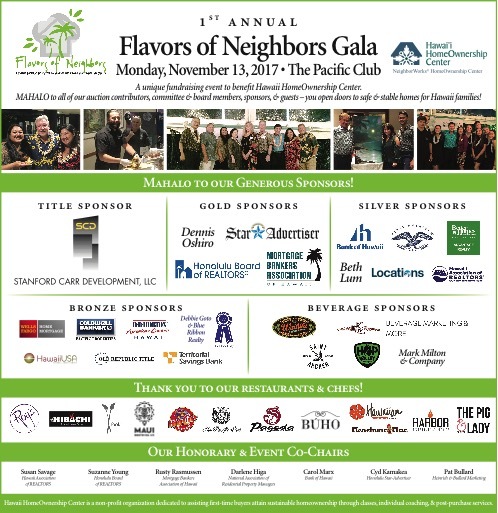 We developed an event called “Flavors of Neighbors,” which held its inaugural gala in mid-November. Over 350 people attended the unique fundraising event that was received as more of a fun-filled party than a dull program event. The comments from attendees and even the employees of the Pacific Club were extremely positive. It was a great success, raising nearly $75,000. For a first-time event with a short window to plan and execute, this was an outstanding achievement. Everyone involved is looking forward to year two and beyond with bigger and better goals. The event had a great committee and we were proud to be a part of it and lend our expertise. We delivered funding and increased awareness to the Hawaii Home Ownership Center. Mission Accomplished.